Tebasaki and Kabocha Jack Bento, a photo by sherimiya ♥ on Flickr. Hi! You make such beautiful bentos. They are so impressive and lovingly prepared. But I was wondering: why do you often prepare the "usual sides" of same fruit and veg -- is that what your kids like best? Anyway, thanks for all the inspiration! Thank you for your prompt reply. Because of your blog, I tried out pluots from the local farmers' market, and oh goodness were they ever delicious! Now just need to find courage to make calzone. Thanks, and happy bento-making! I just found your blog and I'm hooked! Have you tried this chicken recipe with drumsticks? I have a 2.5 year old and I think the little chicken wings might be too difficult to eat by herself. Also, is the Shichimi Togarashi too spicy for kids? I've had it at ramen houses, but it didn't add that much spice to my soup (although I do like things really spicy so maybe I just couldn't tell:)). Thanks! 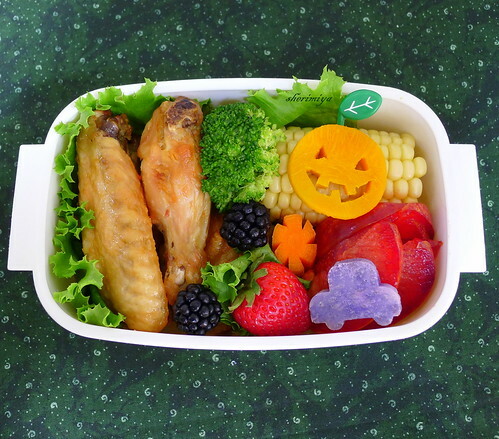 Hi laulaus ~ I think the little wings are a perfect finger food for toddlers, who love to eat with their hands. You can practice with her at home to make sure she doesn't gnaw on the bones :) As for the togarashi, I mention that it might be too spicy for kids, but you can use furikake instead. My kids like it as is, with just the salt sprinkle. You should definitely try it! They are totally addictive! My kids could eat them every week. Not kidding! !